I’ve written before about MQTT as a technology for doing push notifications to mobile. When I wrote that, I gave an example Android project. However, it was the first time I’d ever done Android development, and while it was an okay Java MQTT sample, it was a poor Android sample – I didn’t know anything about how Android works as a platform. I’ve since written other Android MQTT apps, such as a hackday app for pushing updates from websites to your phone and learnt a lot about how to do it properly. Well… if not properly, at least a little better. But Google is still directing people to my old, and probably unhelpful, sample. So it’s about time that I share something more useful. I’ve put the full source for a sample implementation below. (Note that I’m using the Java J2EE client library from ibm.com). Hopefully the comments in it are clear enough, but here are a few of the key points. Let’s start with an easy one. The most obvious screw-up in my first attempt was not realising the difference between Activities and Services. When you’re writing an Android GUI, you extend Activity. Only one Activity runs on the phone at a time – the app the user is using. When you switch to another app or close the app, the Activity is trashed. If you rotate the phone while the app is running, the Activity is trashed and a new one is started to implement the GUI in the new orientation. The point is – Activities are short-lived. Make them pretty. Don’t make them do any long-running heavy lifting. Don’t put any of the MQTT stuff into your Activity. Because it will be killed soon, without much warning. It doesn’t matter if you kick off background threads as they’ll be killed off, too. My first MQTT sample (which did everything in an Activity) was totally unreliable. I created an MQTTClient object which creates a long-running TCP/IP connection. And then if I turned the phone round a little bit, my MQTTClient object would get garbage collected. Instead, I now use a Service. Services are meant for implementing longer-running operations – more than one Service can be running at a time. It doesn’t matter if you’re GUI Activity class gets trashed and garbage collected – the Service can keep running along in the background. An MQTTClient object can survive in a Service object, and it’s persistent TCP/IP connection can be kept open. Services are meant to be long-running, but they don’t stick around forever. If the phone gets low on memory – typically because the user is using an app in the foreground (therefore is treated as high priority) which needs a lot of memory. This happens frequently – it’s not an unusual thing that might possibly happen once a blue moon. My experience suggests that it’ll happen to your Service every day. Several times. My service might bumble along for a few hours happily, but then it’ll get killed off without warning. Here’s something you get for free, but I thought was interesting enough to note. When you create an MQTTClient object, one of the things it does is set up a long-running TCP/IP connection. If a message is received, the callback method publishArrived method is called. When the user isn’t using their phone and has it turned off, Android starts turning stuff off to save battery life. My concern was that turning the phone off might break my connection, or stop the code that is waiting for incoming messages. Although I haven’t found a good example of where this is documented, it seems that even if your phone is asleep, if data is received on the connection, your code will be woken up and publishArrived is called. The MQTT client library code that is blocking on the socket will revive when any data arrives on that socket. Well… you nearly get it for free. When you connect to the MQTT server, one of the parameters is a keepAlive period – an agreement between the client and server for how frequently the server should expect to hear from the client. If the server doesn’t hear from the client for this keepAlive period, then it assumes that the client has gone and closes the connection. The MQTTClient object kicks off a background thread that is responsible for sending a ping message to the server frequently enough to keep the connection alive. I mentioned above that when the user isn’t using their phone and has it turned off, Android starts turning stuff off to save battery life. That includes the CPU. And if the CPU is stopped, this background thread stops. Without the background thread going, after the keepAlive period expires the server closes the connection. If you’re using RSMB, you see that in the server log. The easiest approach is to use a Wake Lock. This is a way for an application to prevent the phone from turning off. By taking a PARTIAL_WAKE_LOCK, you keep the CPU running, even if the user presses the power button. If you take a PARTIAL_WAKE_LOCK before you do your MQTT connect, and keep it, then the CPU will not stop while your app is running, the standard MQTTClient background thread never stops, and the long running network connection is kept up. But… erm… it also means that you’ve stopped the user from being able to turn off their phone! It’s a little aggressive, as it has a big impact on the phone’s battery life. So I prefer to avoid that. Some of my early attempts at an MQTT Service for Android didn’t take a wake lock, but still worked fine. What I didn’t realise was that I had a couple of apps installed on my phone that hold partial wake locks all the time. Even though my app wasn’t stopping the phone’s CPU from turning off, other apps were. And I was getting the “benefit” of this and not realising that I had a problem. The command adb shell dumpsys spits out a ton of stuff about the connected phone, including a list of current wake locks. (Search for ‘mLocks.size’ in the output). You have to do this a few times to get a picture of what is happening – some apps will, entirely legitimately, take a partial wake lock from time to time while they do something critical that they don’t want to be interrupted. The problems are the apps that take a wake lock when they start, and keep it forever – the ones that are always in the mLocks table in the dumpsys output. After uninstalling these apps, the results from my testing was very different, and was what showed me that I needed to do something to keep the connection alive. The best approach might be to write the MQTT client library to work in a more Android-centric way. But, to be honest, I’m too lazy for that – so I’m using the existing Java J2EE client library, but in addition to that I implement my own keepAlive approach, in the assumption that the client library’s one wont be good enough. AlarmManager provides a way to ask Android to wake up a device that is asleep at a specified time, to run a specific method in your code. I schedule something to wake up the phone before the current keepAlive period expires, long enough to send an MQTT ping, after which it is free to go back to sleep. This doesn’t wake up the phone screen if it is off – it just starts the CPU so that my keep-alive code can run. Note that the MQTT specification says that the server should give the client a “grace period” of half the keep alive interval again (e.g. if the keep alive is 20 minutes, then the server wont cut off a client until 30 minutes after it has last heard from it). This means I don’t need to worry about getting my ping in just before the keepAlive interval – there is enough leeway in the specification that I can just schedule a ping for keepAlive seconds after the last interaction with the server. The MQTTClient library has a connectionLost callback that should be called to tell your code if the connection is broken. If you have a long keep alive interval, then the client can wait for a long time before considering that not hearing from the server means the connection is broken. Android provides a notification system to inform your app of such changes. In response to these notifications, I assume that my connection is no longer reliable and re-connect. If you’re using RSMB, you see that in the server log. 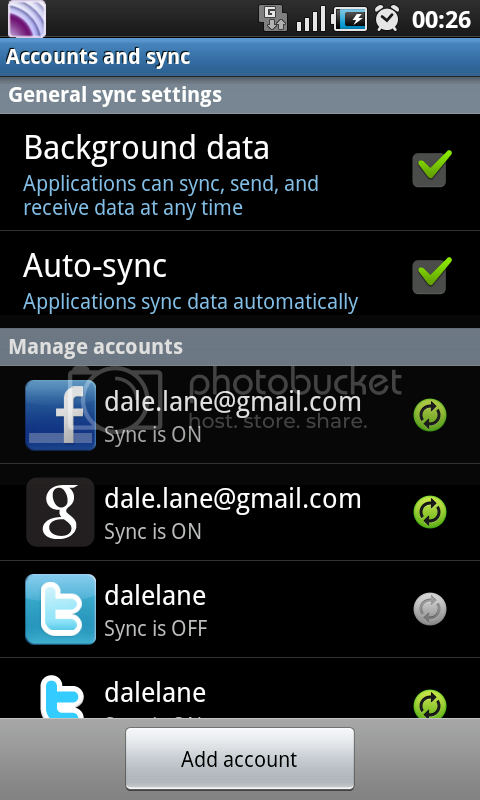 Android provides a way for the user to disable background data use by applications. But this isn’t enforced. The user can untick the “Background data” check to indicate that applications should not use the network in the background, and provides an API for applications to check this value. But applications are free to ignore this. That’s not a good thing – users should be able to decide how their mobile is used. I check this value before doing anything, and set up a listener in case the value is changed while my Service is running. The MQTT specification requires a unique client ID for every client. I’m using a unique device ID from the phone to create this. Annoyingly, this isn’t available on emulators, so with these I’m using a timestamp – the current time in milliseconds since Jan 1 1970. Note that the specification also defines the maximum allowable length for a client ID, so I truncate this as necessary. This is more a general approach thing, rather than a specific bit of code. But the Service has to assume that it will frequently be disconnected, and should handle reconnecting when possible without requiring user intervention. I’ve seen apps (I’m looking at you, facebook!) which if they fail to connect to their server, just get stuck in an endless loop of retries – constantly trying and failing. On a personal note, I have more mobiles than SIM cards. And I notice that with such apps installed, the battery life of the phone is worse when there is no SIM card in it than when there is, in part because these apps are constantly trying to communicate with a server with no network connection. Instead, detect when the network is not available and stop everything. Don’t poll, don’t ping, don’t keep trying or checking, just request to be notified when the connection is back, stop whatever keepalive timers are running, and sleep. And be ready to get everything back up and running quickly when a connection is available again. There is also a consideration for how you send messages server-side. When you publish a message, there is an option to make the message ‘retained’. This means that if a client is unavailable, the server will store messages for it safely, and pass them on when the client reconnects. This might not be suitable for all scenarios, but it’s certainly something that I use a lot, and seems to fit well with mobiles which are often disconnected, the client need not miss messages published while it’s in a black spot. In desktop window environments, users are used to knowing what’s running on their system – because they can see the windows that they have open. On a mobile OS, where only one app is open at a time, it’s harder to have that sense of what is running in the background. It’s okay for Services which are left running to do a specific thing, and will stop when they are complete. But for Services like this, which intend to run forever until manually stopped, the user should really be reminded that it’s there. In my sample, I use an ongoing notification in the status bar, that will stay there whenever the Service is running. This way the user is reminded that it is using some of their phone’s resource. You might think this could get annoying, so perhaps this should be made optional – providing the user with a way to hide the notification if they are happy to leave it running without a reminder. But even then, I would have the notification by default. It’s likely that for the majority of the time that the Service is running, there wont be an Activity UI showing the latest data. The Activity UI might be started at a later time, and will want to be able to access messages that were received while it wasn’t running. This means that the Service should probably store the messages that it receives somewhere. This will be dependent on the particular app. Applications that handle very small amounts of data – e.g. updates and notifications that don’t need to be persisted if the app and/or phone is restarted etc. may find it acceptable to store this data in a variable in the Service. That’s what I’m doing in the sample below – storing it in a local hashtable. Applications that handle larger amounts of data, and/or need the data to be persisted even if the app and/or phone is restarted, need to store the data somewhere safely. There are a variety of storage options available – choose the one that best suits the type / frequency / size etc. of your data. I mentioned the keepAlive parameter above – how frequently the client should contact the server to keep the connection alive. It’s a tricky decision. Ping too frequently, and you needlessly waste battery life. If you ping too infrequently, and you might not notice if you lose your connection until the next unsuccessful attempt to ping. It’s a trade-off between how time-sensitive the data is that your app is handling, against the acceptable impact on battery life. But there are also possibly network specific concerns? How long will a mobile network operator leave an idle connection open before they trash it? For example, it may be that there is no point having a keep alive of 40 minutes, if your user’s network operator will trash an idle connection after 20 minutes. I need to experiment with this more, but in the meantime I’ve been using a keep alive of 20 minutes, which seems to be reliable enough. A small point, but it’s worth thinking about how you give the Service the connection parameters it needs, such as the server host name. There are a variety of ways to do this. As I don’t want the users to have to have to enter these parameters every time the Service is launched, I also needed to persist these settings. The easiest way to persist small amounts of config information in a way that is accessible to the Service and modifyable by the Activity UI is using SharedPreferences – this is how the sample below does it. I’ve outlined previously the basic division between back-end, long running network connection implemented in a Service, and the UI implemented in an Activity. There are a variety of ways that these can communicate with each other. For this sample, I use Broadcasts. It’s essentially a pub/sub engine local to the phone. Whenever the Service receives an MQTT message from the network, it re-broadcasts it locally on the phone. If an Activity UI is running, it will subscribe to these messages by creating a BroadcastReceiver. When the Activity is not active, it can unregister these listeners. This means that the Service doesn’t need to keep track of whether an Activity UI is running or not – removing an element of coupling between the back and front ends of your application. With all of that waffling out of the way – here is the code. My blog doesn’t display code very well, so you’re probably better off copy-and-pasting it into your favourite IDE with Java colouring/formatting enabled. *  push notifications from an MQTT message broker server. //  how often should the app ping the server to keep the connection alive? //  connect to the same broker using the same client ID. if (cm.getBackgroundDataSetting() == false) // respect the user's request not to use data! // have we lost our data connection? *  the specified topic name. Wildcards are allowed. * Terminates a connection to the message broker. //   code may stop running. //   cancelled in favour of this one. //   period, postponing the next ping. //  long as the alarm receiver's onReceive() method is executing. //  finished handling the broadcast." // This is good enough for our needs. // is this a new value? or am I receiving something I already knew? Finally, some comments on how to use this sample Service from your Activity. To start the MQTT client, set the broker host name and topic string to subscribe to in SharedPreferences. Then set up the receivers to get the messages rebroadcasted by the Service. There are two types of messages broadcast by the Service – MQTT messages, and the current connection status. Now you’re ready to start the MQTT Service running. Lastly, you might want to directly call methods in the Service from your Activity. Most of them are private, but you can put some public methods in there. For example, I mentioned previously in ‘Keeping the received data safe’ that when an Activity starts, it may want to retrieve from the Service all of the pushed data it has received while it has been running. But what about… (insert alternative push framework here – e.g. Google’s Push Notification Service)? I’ve written before about why you might want to do PUSH at all. And in this post, I’ve aimed at someone who has decided that they want to use MQTT on Android, and wants some guidance on how. I’ll leave the debate for how MQTT compares with alternative frameworks for another time. I hope this is useful to people – please do let me know in the comments if you use it, or spot something that it could do better. Update 28-May-2011: Updated the code to correct a bug pointed out by Ngewi Fet in the comments. This entry was posted on Tuesday, February 1st, 2011 at 12:36 pm and is filed under code. You can follow any responses to this entry through the RSS 2.0 feed. Both comments and pings are currently closed. Thanks Dale, I’ll look into thread pools asap. And thanks for the article, I’ve been through all the mqtt android examples online and this is the most complete and well written one. sounds good !! am trying this out and wl let you know the results. I didn’t see any reference to the MQTTNotifier.class in com.ibm.mqtt. What am I missing? MQTTNotifier is whatever activity you would want to be launched by the notification – so the Activity for your UI. I have built your service code and am able to test to the point of connecting to a broker. Is there a server that will accept a connection that I can test against? In particular, RSMB http://www.alphaworks.ibm.com/tech/rsmb and Mosquitto http://mosquitto.org/ are easy to get up and running quickly for dev/test purposes. Hi Dale, thanks for the amazing code. I am using it with success, but there’s yet something not working as expected and don’t know how to solve it. After a connection loss, the service manages to connect to the broker and subscribe inmediately after the connection is recovered, however if there was some message sent during that period, it is not recovered inmediately after subscribing but on the next keepalivetimeout. I tried forcing a ping after subscribing but that did not help neither. Are you seeing also this behaviour? 1. Phone is connected and subscribed. 4. Turn on net connection. 1. When the net is turned off, NetworkConnectionIntentReceiver is triggered, but obviously can’t connect. 2. When the net is turned on, NetworkConnectionIntentReceiver is triggered again and connectToBroker() and subscribeToTopic() both succeed without throwing any exception, however the message previously published does not arrive, neither any further published message. 3. After the 2 minutes keep alive period, PingSender is triggered but ping fails throwing mqttNotConnectedException and WMQtt clients prints on console: “Lost connection…”. Then Service triggers it’s connectionLost() method, and connectToBroker() and subscribeToTopic() succeed, and all the messages arrive. Xavier – Sorry, I don’t remember seeing this happening. I don’t have an environment to recreate this at the moment – I’m on holiday – but will give it a try when I get home. Thx Dale I appreciate! Enjoy your holidays now. One thing than comes to my mind Dale, wouldn’t a WIFILOCK be also required at some point? Thanks for the article. It’s really helpful! I have a problem though and maybe somebody else has faced it. I’ve downloaded the Mosquitto broker both for windows and ubuntu. It seems to work as expected when using IBM’s stdinpub.exe and stdoutsub.exe. I can receive and send messages on both platforms (from diffent computers as well). But when I try to connect to the mosquitto broker from android using your code I always get an exception (it basically cannot connect and throws connection timed out exception). Has anybody seen this happening? BTW, When using IBM’s RSMB it works perfectly (android can connect with no problems at all). P.S. All of the devices are on the same LAN. That’s odd – I can’t think of any reason why that would happen. I assume you’ve checked that a firewall isn’t getting in the way? Is there any (debug?) output from mosquitto that might give a reason why this happens, or does mosquitto just not hear from Android at all? It might be worth asking on https://launchpad.net/~mqtt-users mailing list, as I must admit I’ve not tried mosquitto for myself. Dale, thanks for the reply. The problem was that mqtt part was using different IP (problem in my code where server’s IP was set incorrectly while initializing the background service). Thanks for sharing this awesome piece of code! That’s good to hear – thanks for letting me know.